Thank you for visiting our VRBO page! Since we have been owners, our Condo has sold out from May through August every year. We get the Most Reviews with the Highest Satisfaction Ranking in our category. Hilton Head Island is world renowned for its ideal year-round weather, tropical environment, nationally recognized dining, and clean, flat beaches. NEW IN 2016- Upgraded Kitchen- Granite Counters/Cherry Cabinets, New Bedroom Furniture/Lamps, New Sofas/ Cabinet/50" HD TV in Family, HD TV in Bedrooms. New Upright Refrigerator/Freezer! Resurfaced Pool and More Chairs/Umbrellas/Tables! After just 2 visits to Ocean Palms, our family was hooked. Now, we're owners! The Ocean Palms Villas are located in Port Royal Plantation - maintained and operated by the Westin, an oceanfront Resort and Spa. Enjoy a spacious 2-level 3 BR condo in a tropical village at the foot of the Westin. The Westin completed a $30 million renovation in 2013. It's a beautiful resort! Whether your vacationing with family, kids, friends, or your golfing buddies, it's truly paradise for all. Our condo building sits on a quiet tree-lined, dead end lot. Our rear balcony stairs are only steps away from the gate of the largest villa pool with a children's pool. Guests love the location. Close enough to watch your kids from the deck- take a quick break, or carry your favorite things. Rarely crowded even in peak summer, it's relaxing and convenient- when you are not in the mood to head to the beach or resort. The three bedroom, three bath villa is very spacious(1750 SF), and offers a large living area with a cathedral ceiling consisting of a beautifully decorated area with a sleeper sofa, chairs, entertainment center with cable TV, DVD, and wireless internet. Adjacent to the living area is the dining area with seating for six. There are 2 Master BR's and a Guest BR. Each bedroom can be arranged with 1 King or 2 Twins. With the sleeper sofa in the living area, your villa's capacity is eight! Each villa has large washer /dryer, multiple TV's, private baths and the master baths offers a whirlpool tub. There are a multitude of activities at Ocean Palms. First, be sure to rent a mountain bike with a basket! Imagine riding your bikes to the private beach entrance at the Westin in less than 3 minutes, then onto flat beaches as the morning sun rises, or on bike paths through nearby villages. These beaches are known to be one of the best in the country. If you have things to carry like a stroller, or beach chairs-just call the Westin, and a shuttle will pick you up in minutes, and drop you off at the beach entrance. 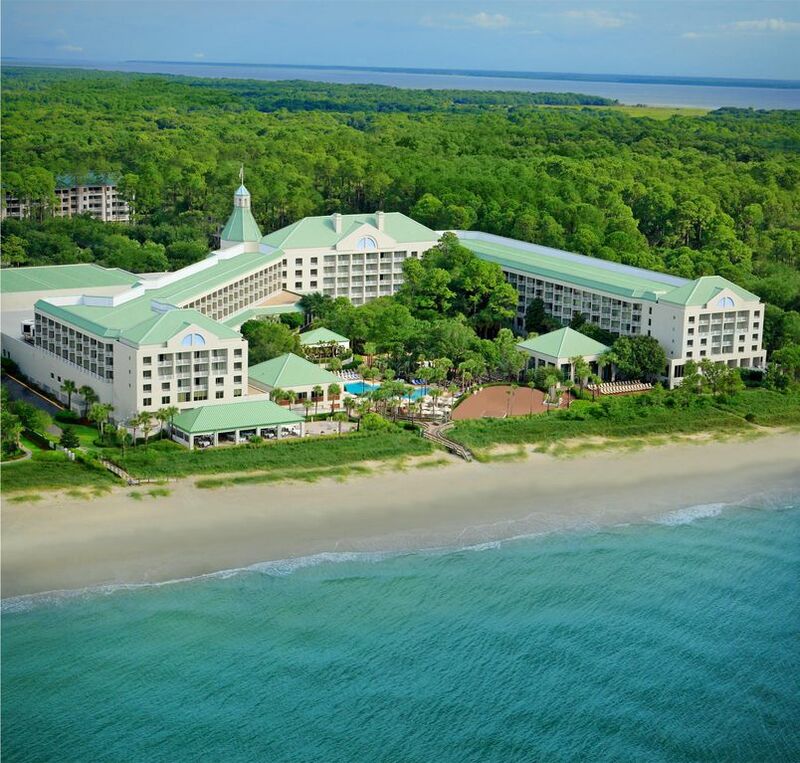 The Westin Hilton Head Island Resort & Spa offers a complimentary shuttle from Ocean Palms Resort to the hotel, the beach and even the Port Royal Golf Course and Shop. Speaking of golf...Golfers enjoy Free daily greens fees(you pay for cart)- for up to 4 players. 2019 Package Offers 3 Golf Clubs with 6 courses-including Port Royal (3), Shipyard (27 holes), and Oyster Reef. You'll save hundreds of dollars! Prefer TENNIS? NEW in 2019- Brand new courts next to the Port Royal Golf Pro Shop. .
Like to run or jog? Designed and certified by Runner's World Magazine, Runner's World Maps are available to Westin guests and feature 3-mile and 5-mile jogging/walking routes from our hotel as well as local running tips. Many owners have said, and we agree, an Ocean Palms vacation offers them the Best Value Vacation Package In Hilton Head. You get all the amenities of a major world-class oceanfront resort, with 5 pools(3 at Westin; 2 in Ocean Palms), 1 heated whirlpool, the Heavenly Spa by Westin, 3 restaurants, state-of-the-art WestinWORKOUT® Gym, golf, tennis and much more! Steps from the beach, stop by the Tiki Hut for lunch or a cold tropical drink. In and around the Villa, there are bicycle and jogging paths, three championship golf courses and sixteen tennis courts. Port Royal Plantation offers a bounty of stimulating activities to choose from. Or explore other area favorites such as kayaking, sailing, deep-sea fishing and horseback riding, all a short drive away from the resort. We're from the Northeast. We believe this peaceful, uncongested tropical setting makes the overall value of this vacation incomparable. Renting with us is uncomplicated. We monitor the rates, and guarantee to be competitive. If you see a lower rental, just let us know. Our unit offers Saturday check-in, unlike most. You will love Ocean Palms in Hilton Head! We appreciate your interest, and look forward to your call. John and Anne from Bethlehem, PA.
"hilton head ocean palms" "ocean palms hilton head" "port royal hilton head"
Keywords: HHI, Westin, villa, condo, Hilton Head, Hilton Head Island, South Carolina, resort, vacation, 3br, pool, golf, tennis, video, youtube, vacation resort, golf vacation, Hilton Head SC, oceanfront, 3br condo, hhi vacations, vacation rental, vrbo, hilton head vacation rental. We're John and Anne Fiore from Bethlehem,PA. After just 2 visits to Ocean Palms, we were hooked! Now, we're owners. You too will love Ocean Palms and Hilton head Island. Well...let me think...Tropical setting. Peaceful. Prestine, Uncongested Beaches. Walk or Bike to beach. Condo is Clean, Convenient, and Comfortable. Best Location- near the large pool. Westin amenities included.Free greens fees, easy access to beach and Westin pool. Best restaurants and beaches in the US. Much better value than the Northeast. How does that sound? Guests tell us that our condo offers the best location in all of Ocean Palms. It's on a quiet, tree-lined, dead-end lot. Our 2nd floor back deck directly overlooks the largest pool in the village- with closest access to the pool gate and gas grill. Very convenient to go back and forth or watch the kids. Never too noisy or crowded. Ahhh, paradise! Located in a great place near golf courses and shopping. The home was very clean and very adequately stocked with kitchen and bath supplies. The Westin was also available to help with any of our needs. The Free Golf was also s huge plus. The scenery was beautiful and the weather was cooperative. We would highly recommend. Beautiful place in a great location! My family really enjoyed our stay at the Ocean Palms. The Villa had everything we needed to enjoy our week. The amenities which included golf and tennis was greatly appreciated! The owner was very responsive making the process easy. We would highly recommend this villa for anyone who wants to have an awesome vacation! We have been going to HH for vacation since the kids were little, and are now that we are grandparents we are continuing the tradition. We obviously need more room now and this unit fits the bill beautifully! The community pool is so close we can keep an eye on the kids if we go inside for a bit, and fixing lunch is a breeze. The use of the Westin Resort facilities are included, so there are five pools, the beach, restaurants, and workout facilities a five minute shuttle ride away. The reduced rate on the three Port Royal Golf courses makes golf even more fun to play. Sometimes we play in the evenings to avoid the heat, and completing 18 is no problem at all. The unit itself is spacious, clean, up to date, and well stocked. John, the owner, is a pleasure to deal with and everything always goes smoothly (we have stayed there here twice). All in all, a wonderful experience we will be doing again. Thanks for coming back again- that says it all! We appreciate you taking the time to write to us. I agree- you can't beat the value of this resort, the villa, location and free golf & tennis. Hope you comeback next year! This unit was clean, well stocked and very convenient. We have vacationed in HH for 25 years and always stayed in Sea Pines. The Port Royal area is lovely and the use of the Westin facilities is a real plus. The walk to the beach is pleasant - although we took the shuttle most of the time because it came so quickly! We have stayed in two other units at Ocean Palms and this one was definitely in the best condition. Most importantly, the owner was awesome to deal with. We found John to be very accommodating and he seems to truly care if his guests have a good experience. We certainly did! Thank you so much for such a complimentary review! We can't be there as often as we like- so it's good to hear that the Westin continues to take such good care of our condo, as well as their own property. The Westin is a real jewel! It was a pleasure to serve you. We hope to hear from you in the near future. As always, perfection! I am hoping to make it again in 2018. Just wanted to thank you for taking the time to write us a nice review regarding your Hilton Head Ocean Palms stay in March. You're one of many repeat guests. We look forward to your stay in 2018. WEEKLY RENTALS ONLY- NO DISCOUNTS OR PRORATED DAILY CHARGES FOR EARLY DEPARTURE. Your Weekly Fee includes: > Accommodations for 7 nights; NO MORE THAN 8 GUEST IN THE CONDO. > FREE Greens fees for up to FOUR- EACH DAY at The Heritage Collection courses on HHI. 2018 (Subject to change) Note: You Pay for cart ($ 34-38 PP); $49-$55 PP at Oyster Reef. **Choice of 5 courses(3 golf clubs)- Oyster Reef, Port Royal (3 courses), and Shipyard (27 holes).Note: $18 surcharge to play Oyster. Call the Port Royal Golf Hotline(843-681-1766) to book ahead 1) 7 days in advance only 2) call hours 7AM-6PM 3) No online reservations. Check www.hiltonheadgolf.net for more info. > FREE Tennis- one hour PER DAY-up to Four at the Port Royal Tennis Club in Ocean Palms- just a short walk from your condo. > FREE WESTIN RESORT AMENITIES: Full access to all facilities including beach front access, pools, beach towels, fully-equipped Health Club, Spa, restaurants, shops, and charge-to-room privileges. > NEW FOR 2019- Brand new tennis courts next to the Port Royal Golf Shop. Call the Golf Course (843-681-1766) for more info and OPENING DATE. Ask if FREE COURT time is available for 1 hour per person per day. > You need to request a key card for the Fitness Center. No charge. > KEYLESS ENTRY. For your convenience, the Westin will give you an entry code for the condo. Very nice! > FREE Shuttle Service to beach, hotel, and Port Royal Golf Club. Just dial 0 from your room, and dial from the beach access to take you back! > FREE Shuttle Service to Shelter Cove Mall- Daily at 10am, Noon, 2PM, 4PM. Subject to change. Check with Westin. > FREE daily USA Today or local island newspaper (located in a pickup box at the pool).